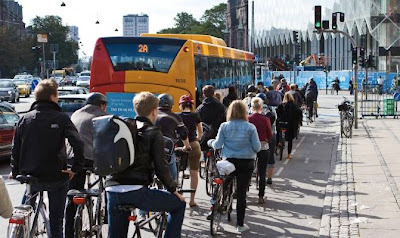 "More bicycles were supposed to make Europe's cities more livable. Instead, the popularity of two-wheeled travel is causing problems in some cities in Holland and Denmark, where traffic jams and parking shortages are common. [...] Cycling has been heavily promoted, and more and more people are taking to the pedal -- but eventually cycling paths, bike racks and other parking areas have begun to run out of space. The bike boom -- long seen as the universal solution to roads jammed with parked cars, dead inner cities and other urban maladies like noise, smog and lack of exercise -- threatens to choke on its own success."